Many times it is those seeking to push the limits and game Google’s algorithm that give us a glimpse into how links can truly be evaluated and how much ranking power each link yields. Those of you in the 'Net marketing industry have heard time and again that you need to create great content and earn great links if you want to rank your site or those of your clients. Not long ago we touched on how to create predictably great content so today we are going to look at how you can dive deeper to determine the actual value of a potential link to your site, using a method common to private blog network (PBN) domain buyers. For this article here is an example expired domain that we are going to take a closer look at: www.treelinerally.com. As you can see, it has a trust flow (TF) of 17 and citation flow (CF) of 24 which is within the acceptable ratio which is between 1-2 when dividing TF by CF. 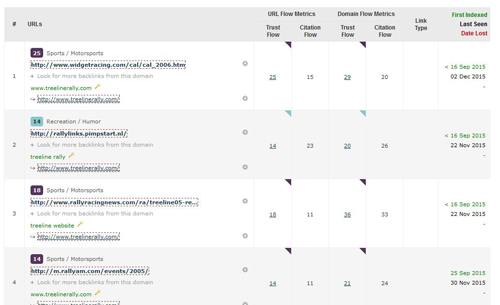 Trust flow is a measure of the trustworthiness of a website and citation flow looks at the potential for a site to be influential based upon how many sites link to it. Starting with this check is a good way to quickly identify spam sites as they often have a high citation flow with a disproportionately low trust flow. 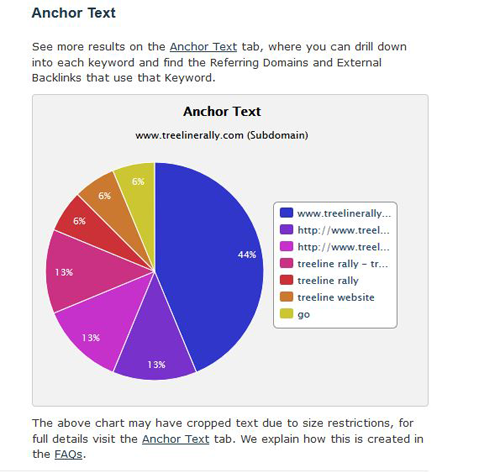 The next thing you should look at is the anchor text overview of a potential inbound link. The example below has anchors mostly using brand name or the URL, which is what you want to see. On the other hand, sites with anchor texts like: buy cheap NFL jerseys, buy Viagra online or high percentages of commercial anchor texts are sites you want to avoid. Links coming from related sites are more powerful than links with the same metrics coming from unrelated websites. 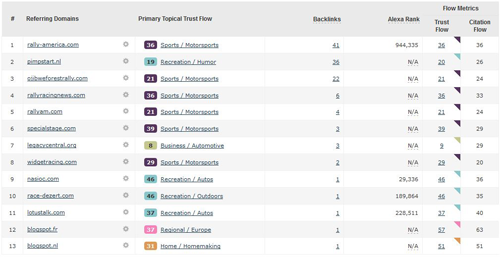 Topical trust flow is a quick way to understand what Google likely thinks a site is about based upon its inbound links. Below you can see that this site is primarily about sports/motorsports with secondary topics of recreation/humor and news. In this case, if you site is about motorsports, this would be a great topically relevant link to obtain. A lot of people stop after completing the above checks but that is a mistake. In order to better understand the real value of a link, we need to see where the links are coming from that have powered up these metrics. In order to do this we need to look at two things: referring domains and backlinks. In the image above we can see that the strongest trust flow comes from http://www.widgetracing.com/cal/cal_2006.htm but the makeup of that page will tell us just how strong the link really is. For example, if we were to open that link and find that it only links out to the site we are reviewing, the trust flow of 25 that page has is mostly flowing to our site. If on the other hand we open the page linking to our site and find it is a links page with 25 outbound links, we need to divide the trust flow of 25 by 25, giving us the power of 1, much less influential than when we have the only link. You should look through the top incoming links of the site you are attempting to gain a link from and use the aforementioned method to see how much power is actually flowing to the site. Using this method you will see that in many cases links coming from less trusted sites with fewer outbound links can actually be more powerful than a resource page link on a more trusted site. Aside from looking at the backlinks on an individual basis you also need to look at the number of referring domains to a site. If you spend several hours writing and pitching a post to a high metric site with only one strong referring domain, you are wasting your time because if they lose one link, the SEO power of their site is dramatically reduced. For this reason you should look for sites with several referring domains that are of high quality. If you are going to invest heavily into earning a link on a site like this, you may even look closer at each of the sites linking to their site before getting started. When buying an expired domain it is common practice to check the site's history in archive.org. On large and popular sites this step isn’t really necessary but if you are doing outreach to smaller bloggers, you may want to do a quick check to make sure they haven’t unknowingly bought a domain with a dark past. In the example site we are using the archive shows it was a rally race themed site and has not been used for other purposes. One last step that can help you evaluate the strength of a link or domain is to check the domain authority of the site. Using the Bulk DA checker we can see the domain authority of this expired domain is 13. If you are looking for a link on a live site that DA should be much higher (20+) but for an expired domain, a lower DA is pretty typical. In order to make the most of this metric a commonly used formula is to add trust flow and Domain Authority and divide that by two. 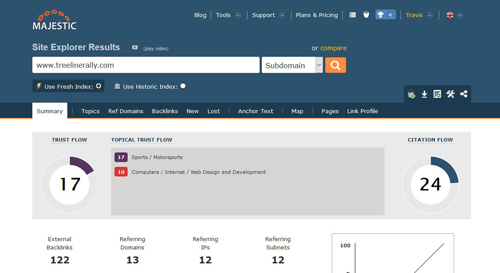 In the case of our example domain, the trust factor is 17 and the domain authority is 13, so when added and divided, the strength of a link from this site would be 15. Using this same formula you can gauge the strength of your competitor links and devise a strategy to build links of greater strength. In this case, this site passes all of our checks and if we were in the market for a motorsports related link or domain, this one would be OK to use. If in the archive we found versions of the site that did not match the topical relevance, contained drug or pornographic content, or was clearly used for spam of any sort in the past, we would want to pass on this domain. The domain used as an example was available to register as of 12/13/15 so if you are in the market for a motorsports domain, better snap it up fast! While we talked about finding links with SEO value, that doesn’t mean you should skip links that can send targeted referral traffic to your site, this is just meant to help you better understand what quality link looks like. What are some checks you use to determine the SEO value of a potential link?